Arizona is home to some of the yummiest cuisine in the nation. Authentic southwestern dishes can be tricky to make for those of us who are not so familiar with the culinary arts, but these simple dishes are easy enough for anyone! Here are five easy southwestern inspired snacks! Salsa is the Southwest’s trademark dish-topper. Put it on fajitas, tacos, burritos, or just about anything for that matter! For salsa that’s fresh and full of flavor, finely dice a few ripe tomatoes, a handful of cilantro, and a small onion. Mix in your favorite minced up peppers, such as green bells or jalapeños, add in a spoonful of red wine vinegar, a touch of olive oil, and you’re in business! Like salsa, guacamole can top just about any Southwestern dish. All you need to make it is 3 or 4 ripe avocados, a small diced tomato, a small diced onion, fresh cilantro, the juice of one lime, and salt and pepper for seasoning. Scoop the flesh of the avocados out of the skins and mash it with a fork. Mix in all the other ingredients, and, if you like, spice it up with a little garlic powder. 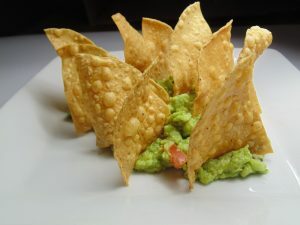 Serve your guac with tortilla chips and enjoy a delicious snack! Ever find yourself throwing out meat scraps or quarter-full cans of beans or corn? Nachos are perfect for ridding your fridge of any and all scraps that are cluttering it up. Instead of tossing them, make them into a meal! Line an oven-safe metal tin (an old pie tin is perfect) with your favorite tortilla chips. Place your scraps evenly on top of the chips and add as much shredded cheese as your heart desires. Broil it in an oven at 400 degrees for 2 to 4 minutes or until the cheese is bubbling. Top with sour cream or perhaps salsa and guacamole from the recipes above! Quesadillas are another great way to clear some space in the fridge. All you need for a delicious quesadilla is two flour tortillas, and some of your favorite shredded cheese— cheddar and jack usually yield the best results. Make the quesadilla like you would a sandwich. Place your assorted leftovers on one tortilla, cover them with shredded cheese, and place the other tortilla on top. Cook it in a stovetop pan on medium high heat for 3 to 5 minutes or until the cheese melts. Flip the quesadilla once to cook evenly. Serve it up with sour cream, if you like, and enjoy dinner! For a simple soup recipe, grab a few cans of beans, some chopped garlic, a can of diced tomato, chicken broth, 6 pieces of bacon, and a large saucepan. Sauté the bacon and set it aside. Add the chopped garlic in a bit of the leftover bacon grease for 1 minute before adding in 3 cans of black beans, drained and rinsed. Mix in 2 cups of chicken stock and diced tomato, along with chopped bacon, and bring the mixture to a boil. Then blend the soup in a food processor until it is smooth. Serve it with jack cheese and hot sauce for garnish.